Offense has been on the decline in Major League Baseball. The average number of runs scored per game is just over four at 4.11 runs per game, down a full run since 2000 and down .70 runs since 2004, the last season before mandatory drug testing. What has been the cause? Is it the end of steroid usage? The influx of great pitching? Or, is it the increase in defensive shifts? I say all three have contributed to the offensive decline. So what are the ramifications? Some say attendance has been lower because fewer runs are scored. Fans like big bats. Attendance is somewhat lower over the last few years, but those years reflected all-time highs. Overall ballpark attendance is still pretty strong, 2013 saw the sixth highest attendance totals ever. Others say television viewership is suffering from low-scoring games. Local ratings are still very high, 28 of the 30 teams are in the top 9 of the local prime time ratings (the two teams not, the LA Dodgers and Houston Astros, just launched new networks within this past year). But national viewership is down. The 2013 World Series was the fourth lowest ranking of all time. Some argue the lack of offense is dragging the sport down. I happen to disagree because I think a good pitcher’s duel is just as entertaining as a big old slugfest. Brain versus brawn provides enough drama to keep the nation’s pastime relevant. Lately there have been major rumblings about banning the defensive shifts to improve run production. On July 22nd Sports Illustrated’s and FOX Sports’ baseball analyst/writer Tom Verducci published an article quoting an anonymous hitting coach, calling for a ban on defensive shifts to drive up run production. This is a terrible idea. Defensive shifts, while more prominent in today’s game, date back as far as 1870. It is not a new concept as many think it to be. It is a tactic that has been used against legends like Ted Williams and Babe Ruth. These shifts are just part of the game. If one of these big bats would hit a single to left consistently, the shift would be useless. There is no need to ban such shifts. The number of shifts implemented has skyrocketed in just the last four years. In 2010 a defensive shift was used 2,465 times, a large amount, but miniscule compared to the projected number of shifts in 2014, 12,737. These shifts have been incredibly effective against dead pull hitters; most of them left handed power bats. 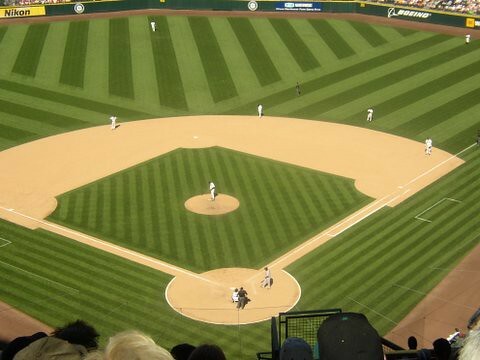 When a shift is employed, what typically happens is all of the infielders will move towards first base. The third baseman will be where the shortstop normally is, the shortstop is now at second, and the second baseman is now playing in shallow right field. A huge gap opens down the left side of the field. Big sluggers such as Reds outfielder Jay Bruce, Phillies first baseman Ryan Howard, Red Sox DH David Ortiz, White Sox DH Adam Dunn, and Pirates third baseman Pedro Alaverez have each struggled mightily against defensive overshifts. None of these players have a batting average higher than .250 on a ball pulled towards the first baseman. Baseball has been a game of change throughout its history. In the 1880’s pitchers were so dominant, owners moved the mound from 50 feet to where it currently stands at 60 feet 6 inches. In 1969, after what has been called the Year of the Pitcher, the mound was lowered from 15 inches to just 10 inches (by the way the average runs scored per game that season was an all-time low of 3.42). A few years later in 1973 the American League introduced the Designated Hitter. The game has changed back and forth between pitchers and hitters. This current phase is nothing new. Joe Maddon, manager of the Tampa Bay Rays, and a former hitting coach, is a big proponent of defensive shifts. Maddon was one of the early adapters of the recent surge. Maddon says in the same Sports Illustrated article that it is an organizational need to teach players how to hit to all fields, but it is one that will take time: “You can’t make the same impact with guys already at the major league level.” Meaning it would take time for young minor leaguers who are now learning the skill of scattering the ball and driving it to both gaps to come up to the major leagues. Can baseball survive such a lengthy decline in offensive production? Because of those very fears, the thought of banning defensive shifts is gaining some traction. There is an idea floating around that would not allow three infielders on one side of second base. The shortstop could only be as far right as directly behind the second base bag. Thanks to the rise of advanced metrics and the availability of information from places such as Bloomberg Sports, knowledge of where a batter is likely to hit a ball has become almost common knowledge. Banning managers from using these metrics to their advantage would be a big step backwards. Part of the reason why offense in general is in decline is due to the spike in strikeouts. Batters are striking out at a rate of 20.3% per plate appearance, the highest rate ever. The current philosophy is that a strikeout is not bad… at least compared to a double play. In 1990, batters struck out approximately 15% per plate appearance and during the Babe Ruth era, hitters struck out at a rate of just 8%. What few realize is how easy it is to get past these shifts. During Game Four of the 2009 World Series, New York Yankees centerfielder Johnny Damon stole second base and immediately swiped third because there was no one covering third base as the shift was on for first baseman Mark Teixeria. There have been many batters, including former New York Mets and Toronto Blue Jays first baseman Carlos Delgado, who simply laid a bunt down the third base line, because it was completely vacant and the shift was thwarted. Defensive shifts are good for baseball. Things will even out for the hitters. They always have, eventually.